I love cooking different cuisines eventhough my favourite always goes to Thai cuisine. Today we are landing towards to the flavoursome Persian or Iranian Cuisine. This cuisine have some mutual culinary influences from many cuisine especially Indian, Central Asian. Fresh herbs are usually used along with fruits like prunes,apricots,raisins and pomegranates. Typical Persian main dishes goes for rice with meat, mostly chicken and lamb. Persian flavourings such as saffron, dried limes, cinnamon and parsley are mild delicately and used in some special dishes. 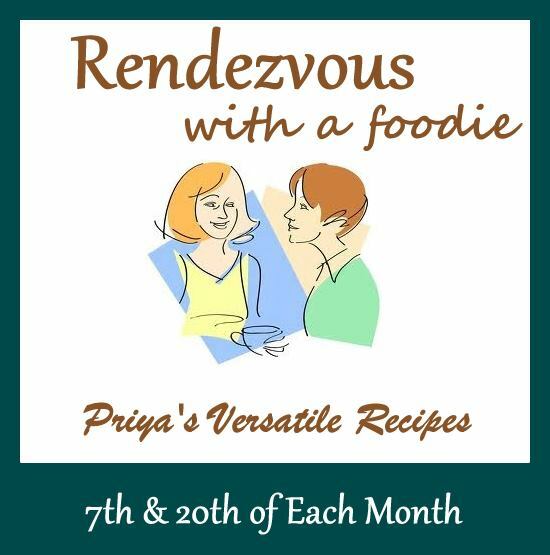 For this month International Food Challenge ,a monthly event started by two wonderful food bloggers Sara and Shobana, Savitha of Savitha's Kitchen who is the host of this month chosed delicious and beautiful Persian dishes. From the list of recipes she gave i chosed to cook this fantastic grilled saffron tofu instead of chicken as per the original recipe went for. Trust me, this tofu is an incredible starter to enjoy simply with a pickling sauce or you can truly enjoy this saffron tofu simply with some salads. 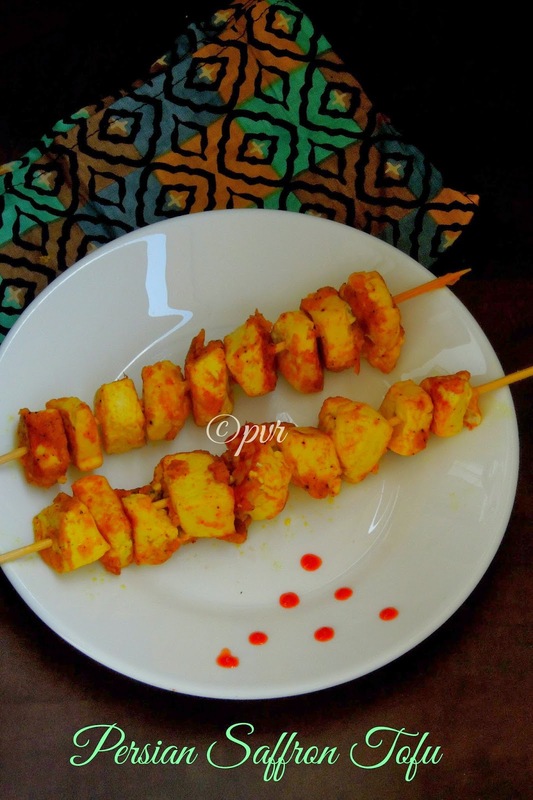 If you want to make with chicken, just go on am sure this Persion saffran chicken kebab aka Joojeh Kabab will tastes simply awesome too. Cookies are kid's favourite, either with chocolate chunks or nuts. 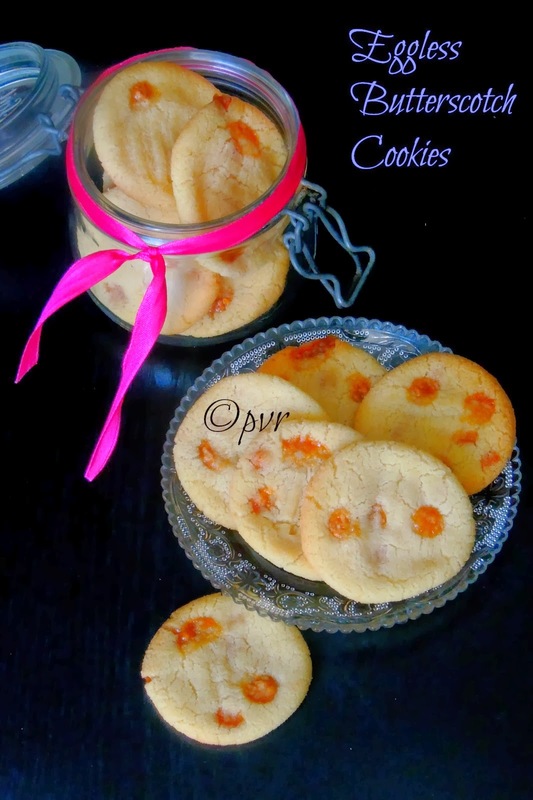 However if am making cookies,i'll try to add whole grains just to feed them easily without their knowledge.But this time, these cookies are almost like butter cookies, with simple ingredients these cookies are just simply like melt in mouth type of cookies. With butterscotch chips in it, these cookies are seriously very chewy and definitely a kid's friendly evening snacks.I have been searching for butterscotch chips here, but somehow i always missed the chance to get them here. But during my stay in India, i got a packet of butterscotch chips from a retail shop there, without any fail i came back home with it.This is the first time am using butterscotch chips in my baking and i found them very interesting. 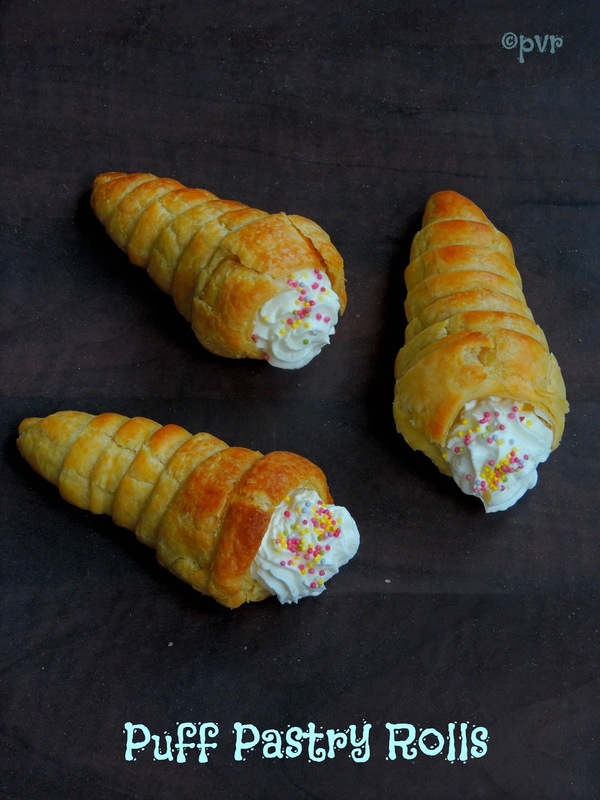 Today is my third post for this week's blogging marathon and my theme for this week is Kid's delight - After school snacks. Obviously these chewy,buttery cookies are prefect after school snacks, my kids just enjoy munching these scrumptious cookies for their snacks with their cup of milk.Sending Bake Fest#29 event by Vardhini,hosted by me.Check out the Blogging Marathon page for the other Blogging Marathoners doing BM#38 . Kids love bread, especially for their snacks with their favourite spread, my kids just adore Nutella spread, but i decided not to buy this chocolate spread from stores. 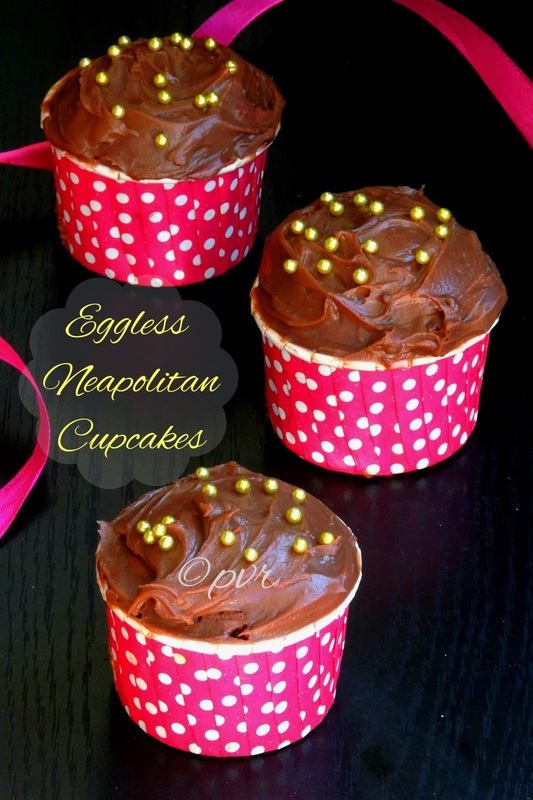 Obviously i replace this spread either with dark chocolate chunks or else with chocolate chips in my bakes. 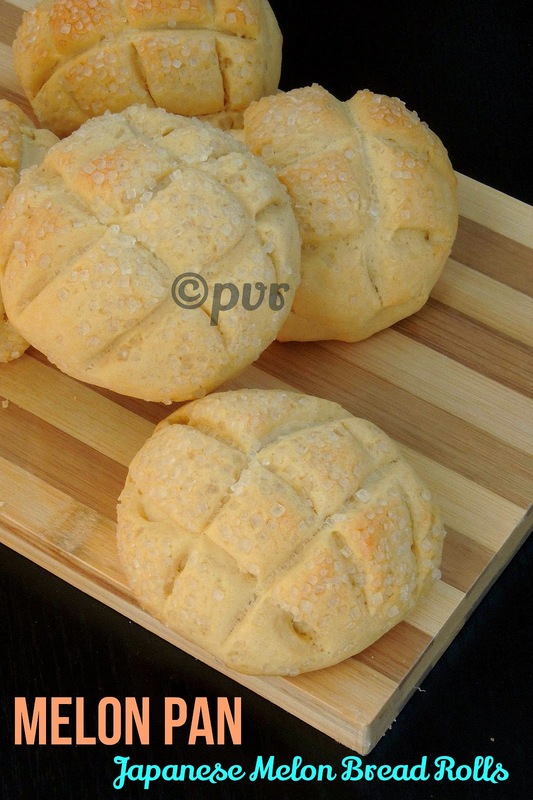 Pull apart bread suits prefect for evening snacks, i have already prepared varieties of pull part bread at home. Coming to this pull apart bread, the shape of this bread is just quite different from the usual one, i enjoyed making this cuties at home for my kid's evening snacks. 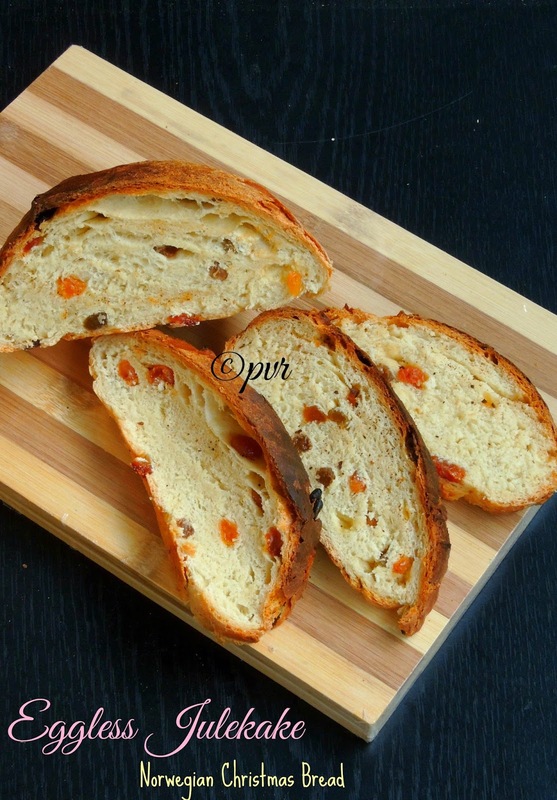 This bread goes for an egg, you can omit it very well with silken tofu or simply with flaxseed meal.For the past three months coz of my trip to India, i couldnt able to participate Defi Boulange, a fabulous bread baking event by Nadia and Manue. 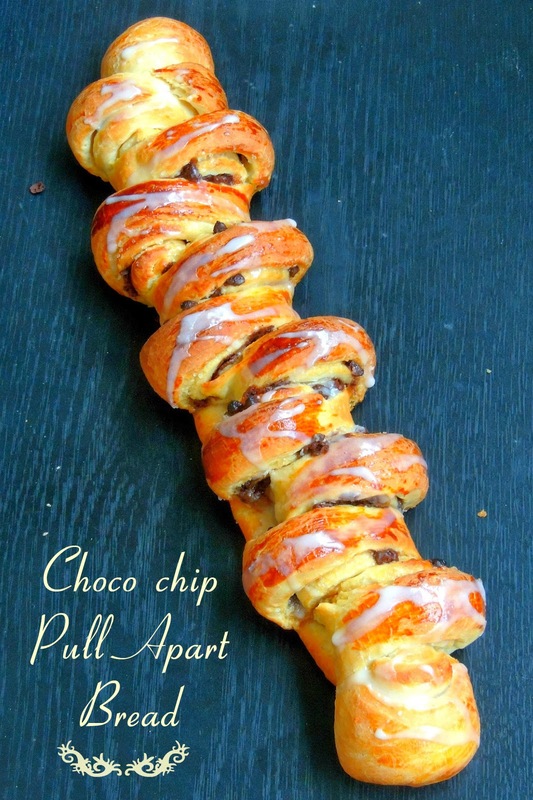 But this month i dont want to miss their incredible challenge, our this month's challenge is this Cinnamon Pull apart bread,but i just replaced cinnamon powder with chocolate chips. From the given ingredients,you can make 2medium sized pull apart breads or just a large pull apart bread, its an excellent evening snacks for school going kids.Obviously am posting this bread today, as am running my second week of blogging marathon with Kid's delight-After School Snacks as theme.Sending to Sangee's Love2Bake and Bake Fest#29 event by Vardhini,hosted by me.Check out the Blogging Marathon page for the other Blogging Marathoners doing BM#38 . Evening snack is very important for kids, that too after a long day in school. My kids are not expectional too, they just love their evening snacks much more than their dinner. Obviously i'll plan to make many different snacks at home instead of buying them from stores. Also French stores have varieties of biscuits,chips and sodas than healthy snacks. Its better to make snacks at home here than buying, as am a health nut i like to feed my kids with healthy stuffs in their snacks. So i'll try to add more veggies or else greens in their snacks, today's recipe is also one among those healthy snacks i have prepared during last week for my kid's snack box. 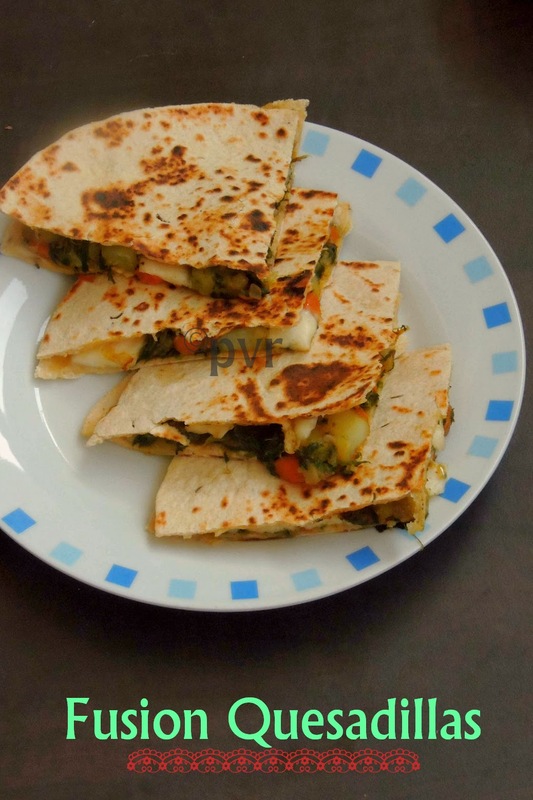 Am running my second week of blogging marathon with Kid's delight -after school snacks as theme,today's fusion quesadillas with loads of veggies, spinach and mozzarella cheese makes a filling and healthy after school snacks. You may wonder why i named this dish as Fusion Quesadillas, i have a reason for it. The stuffing i went for making this quesadillas is purely an Indian spiced masala with mixed vegetables and spinach, while the cheese i used is the famous mozzarella. 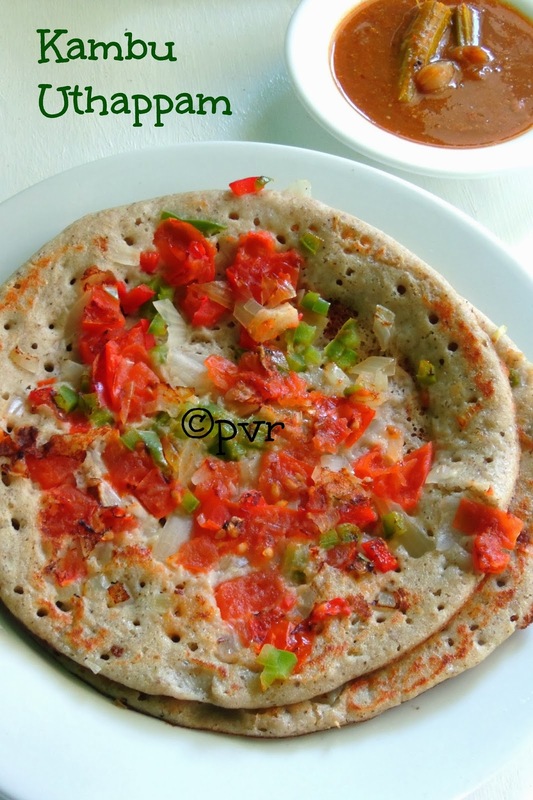 When an Indian masala with mozzarella cheese stuffed in between two whole wheat tortillas makes obviously Fusion Quesadillas na.Sending to Viji's SYS-W series - Hidden Ingredients..Check out the Blogging Marathon page for the other Blogging Marathoners doing BM#38 . Sunday brunch is something i would like to have atleast once a month, i truly enjoy it coz my weekend working H will have his brunch with me. Obviously if he is at home, i'll make special brunch dishes for him. He loves french toasts very much with a simple home made fruit juice for his brunch. Needless to say i'll make different fruit juices freshly for the brunch. 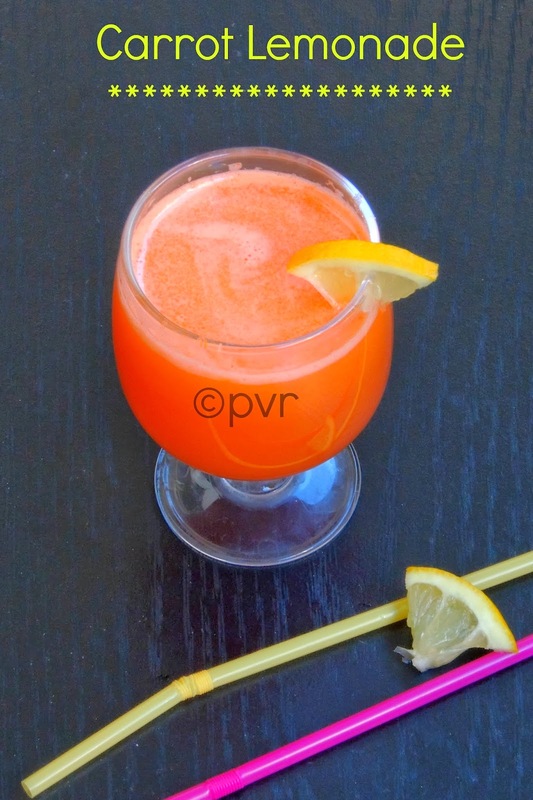 Today i have prepared this gorgeous looking carrot lemonade for our brunch hence am posting it today as i belong to a group of bloggers who blogs twice a month on sundays, our group name is Let's Brunch On Sundays. Coming to this carrot lemonade, this super fresh drink goes for easy breezy ingredients, just a carrot, lemon juice and some grated ginger with sugar makes this beautiful drink. When served with ice cubes, you can enjoy this lemonade thoroughly during summer, yes this drink is definitely a summer drink , a fantastic healthy thirsty quencher. My today's guest host is one among a newbie blogger who i have crossed recently, one fine day she pinged me asking whether she can join this event. Who can resist to this friendly request? i said immediately Yes. When she pinged me i was India, with a nasty net connection i couldnt able to chit chat with her for a long.Thank god she was very humble and accepted immediately the slot i suggested to her. Then later once i came back home, i pinged her and we talked for a while. Trust me, she was very kind enough to accept when i changed the slot i have suggested earlier coz of an another blogger who is in vacation. Do you want to know whom am talking about?? She is Sundari Nathan of My Magic Pan. We dont need many years to get connect in this virtual world, we get easily friends here that too if you have same passion. Myself and Sundari have same passion of foods thus our friendship is growing up day by day and am thanking god for giving me this wonderful sister aka blogger friend.This virtual bloggy world never let me down and its like a mother who never forget to give much love and support.Sundari shares many delicious dishes in her 5 months old blog baby, you can authentic dishes,beautiful bakes and more delicious foods.Just go through her space to see all her efforts she is putting on her space since October 2013.I have few favourites from her space eventhough i love very much her prefectly prepared delicious Mysore pak.. 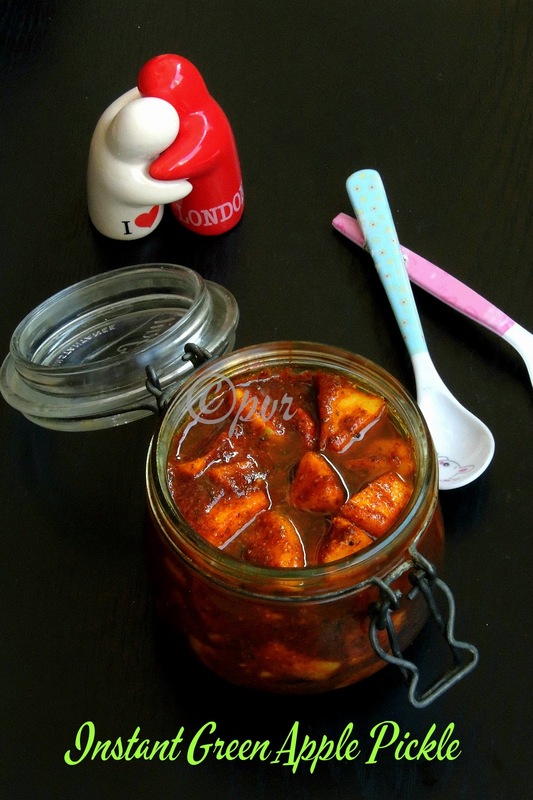 If you are searching for a different, an easy breezy and a vegan chutney, just you need to go through this post. 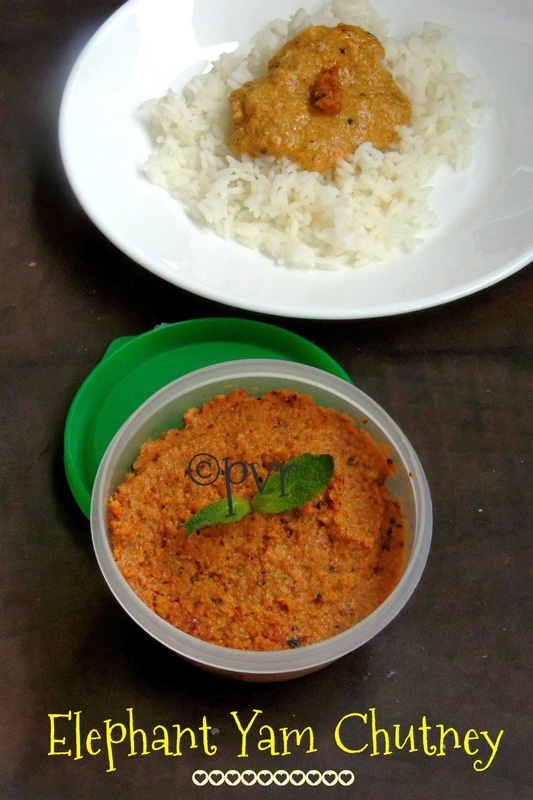 This thogayal aka chutney goes for the most itching and most hated vegetable Elephant yam. I have seen people who never touched this vegetable in their life as they dont like peeling or cooking with this yam. 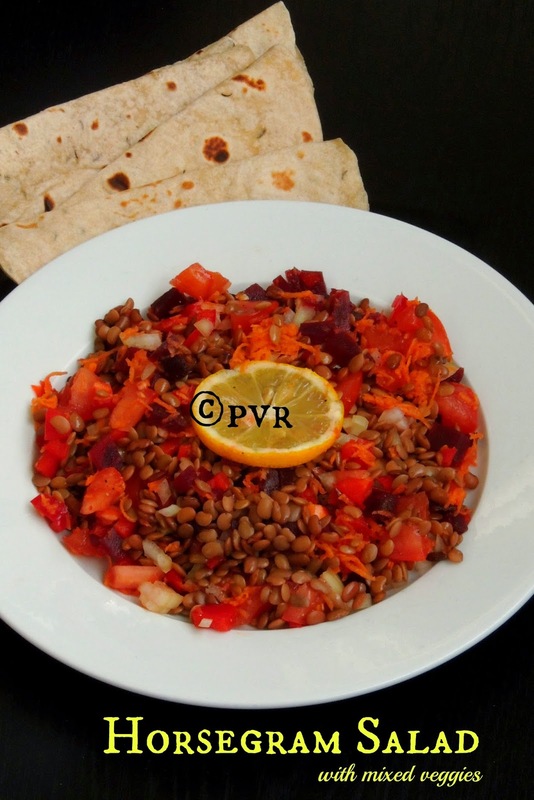 But trust me, this thogayal will change their opinion about this vegetable, this dish goes for simple cooking and the tamarind used in this dish makes this dish more delicious and tangy. A prefect side to enjoy with any dish, eventhough i enjoyed thoroughly this thogayal with curd rice. 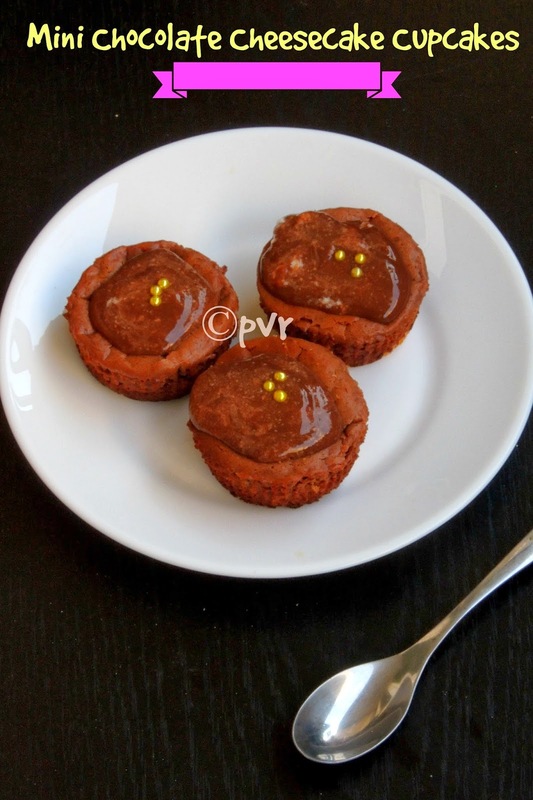 Today is the first thursday of the month, myself and a bunch of the members of the Vegan Thursdays, an vegan event running twice a month,are supposed to share a vegan recipe today in their respective blogs thus am posting this fingerlicking thogayal today. If conserved properly,this thogayal or thuvaiyal stays prefect in fridge for more than a week.This thogayal is our family favourite now. 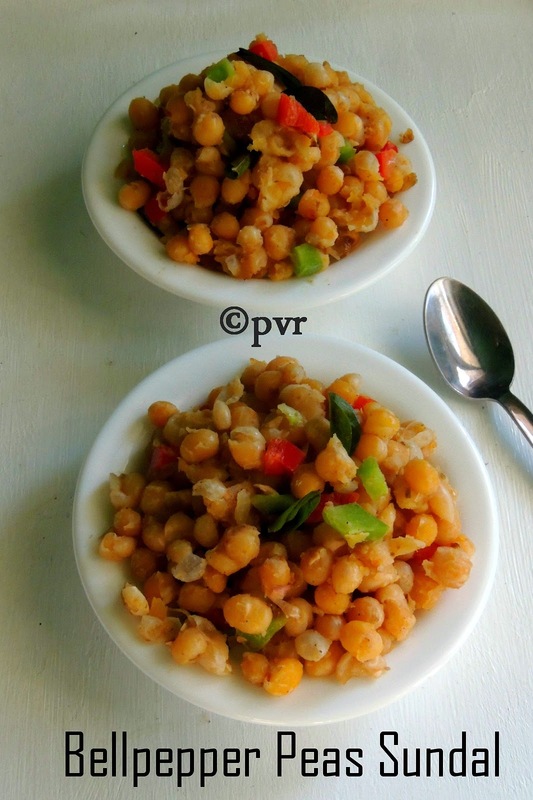 Just make some and enjoy this mildly tangy thogayal. 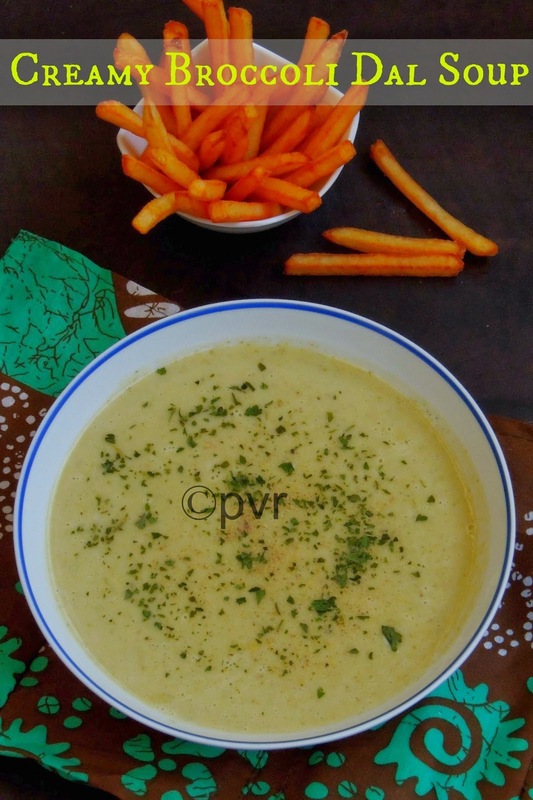 Whenever you talk about naan, am sure you would have heard lot about Garlic naan, after butter naan this flavorful garlic naan is very much popular among the other varieties of naan. After making a baked naan and a fusion naan, finally am posting today a simple and a very flavourful garlic coriander naan.Garlic and coriander,this combination works absolutely fabulous for making garlic butter,needless to say this combination also works very much in Naans too. Today is the final day of this week's blogging marathon, as i chosed different Naan as theme for this week's blogging marathon am posting this very delicious garlic coriander naan. We enjoyed thoroughly this fantastic naan with our family favourite channa masala for our dinner. 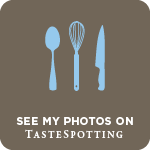 When i chosed Naan as theme for this week's blogging marathon,i seriously want make some flavourful simple spring onion naan. But last weekend when we went to our nearby farmer's market, i couldnt spot out green spring onions, immediately i dropped that idea and went towards the leek. Leek is a vegetable that belongs to onion and garlic family.Since leek have a mild onion like taste, i thought of using it in this Naan.The edible part of the leek are the white base of the leaves. Usually Leek is used for making vegetable stock as they add flavour to them. Leek can be boiled,cooked,or can be eaten raw in salad. However i cant tolerate leek as raw, usually i finish them by making a warm bowl of leek potato soup or else i'll make quiche with it. This leek naan came out extremely well with a wonderful flavor, the taste was almost like onion naan. 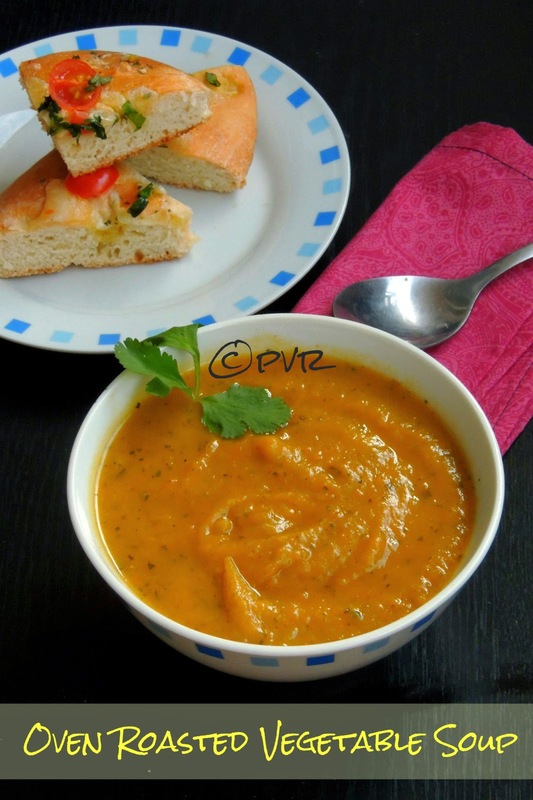 Just with some spicy masala or kurma am sure you can definitely have a satisfying meal with these flavorsome Naans. Give a try to this leek naan, am sure you guys will definitely love it.In case if you dont get leeks, you can replace them very well with spring onions or garlic chives. 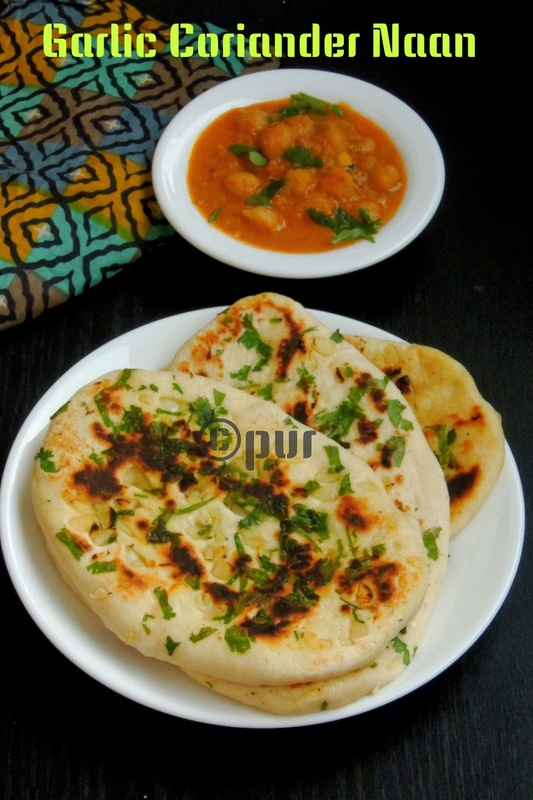 Naan is one of the popular yeasted flat bread usually prepared in tandoor stove, but trust me you can make them very well at home either by baking through oven or simply in a tawa. You can prepare naan either with yeast or else simply with baking soda and baking powder if you dont tolerated yeasted dough. However the choice is yours and you can make your naan at home easily just with simple basic ingredients. 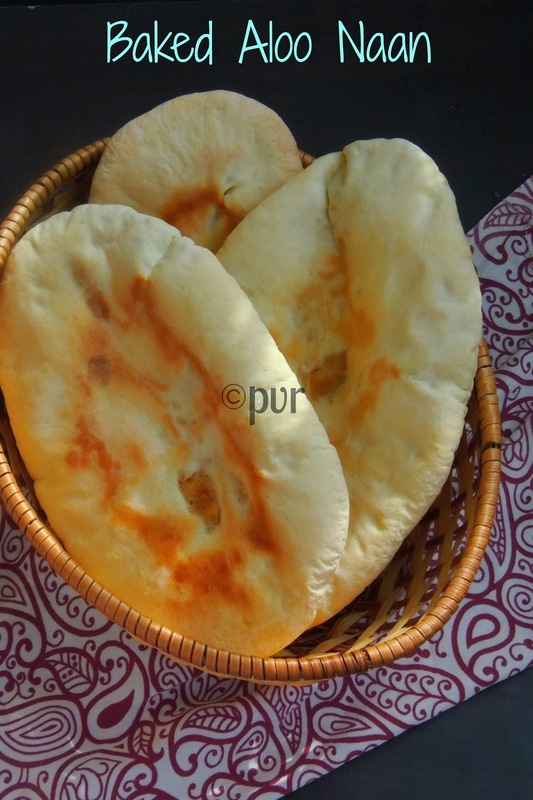 Earlier before starting my blog, i usually buy Naans from an Indian store, then a friend of mine was kind enough to share the tips for making naan at home since ever i tried my first naan at home i never bought them from stores. Nothing can beat the homemade na. After two months break to Blogging Marathon, today am running with other marathoners my first week of 38th blogging marathon. Am very happy to join the gang after a small break, my theme for this week's blogging marathon is going to be different naans. Obviously i'll be sharing three different naans and today's naan recipe goes for potato masala stuffing and baking.Stay tuned for the next two more Naan recipe am gonna share in my space. Today is a celebration day for me, yes am celebrating my sister's birthday virtually. She is none other than my sweet sister Priya Ranjit, who blogs at Cook Like Priya. She is not only a blogger, a fantastic friend, a down to earth person, a jovial darling who never fail to make you laugh with her instant jokes.We, a bunch of my co-bloggers aka friends joined our hands together to celebrate her birthday virtually. Eventhough we live in different countries,the distance between us may separate us but the love we have for each other is just growing day by day. The Theme for this virtual birthday treat is rose colour dishes. 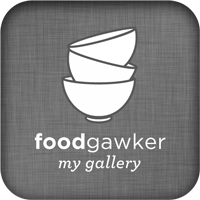 Immediately i thought of making beets kheer,rose milk and list goes on. But finally i went for making an interesting fusion dessert with gulab jamun,malai and Rooh Afza , sounds quite innovative na. Roof Afza is a non alcoholic concentrated squash sold commercially as a syrup to flavor sherbets,cold milk drinks,icecream and many more cold desserts. 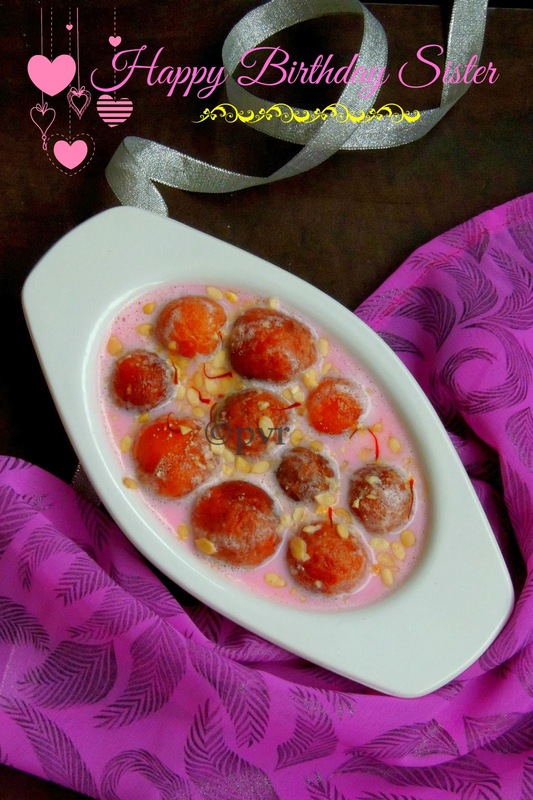 Trust me,this rose malai jamun was a big hit at home and we couldnt stop ourself having this juicy,spongy,very delicious rose malai jamun. 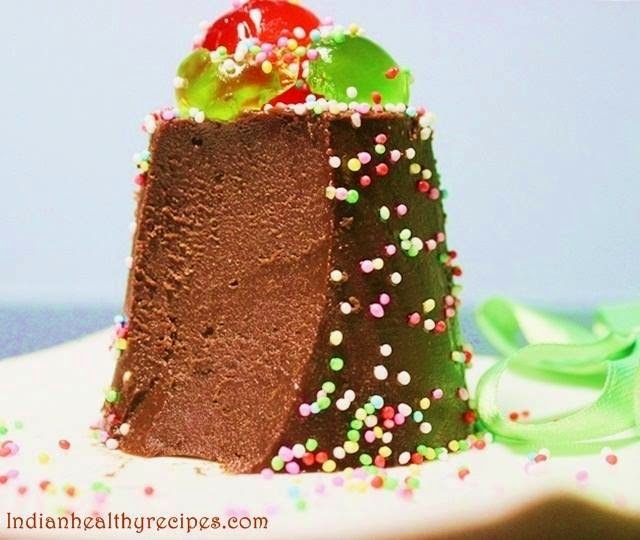 If you want to make a different sweet for a celebration, i'll definitely advice you to give a trial to this incredible sweet. In case if you dont like rose flavour, just skip the addition of roof afza syrup and just enjoy this sweet as Malai jamun. I dont talk to you everyday, but you are in my heart everyday. A sister can be a good friend and you are. You are the best, most wonderful,lovingest sister in the world. Happy birthday to my wonderful sister, enjoy your birthday and make more memories. 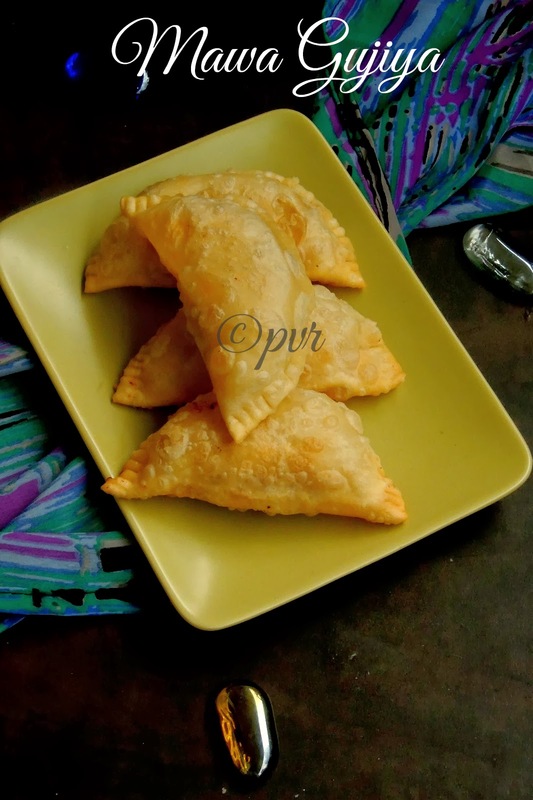 Mawa Gujiya is a very popular and common North Indian sweet prepared during festive season. 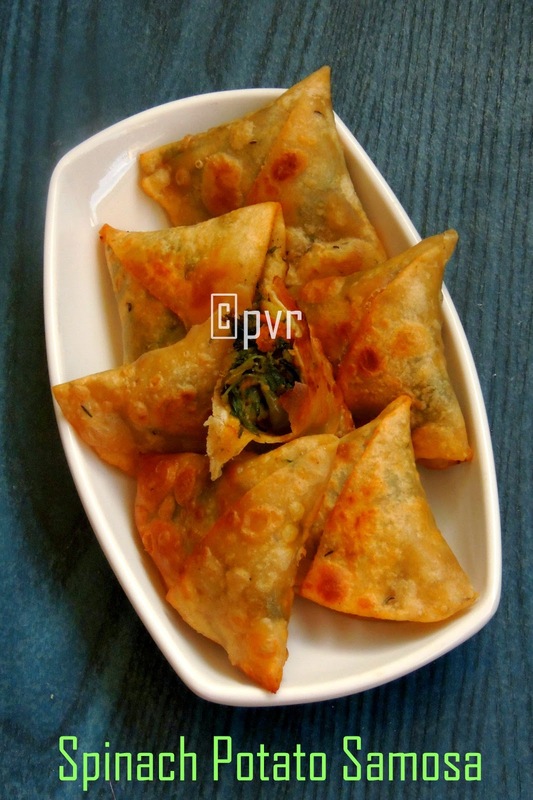 Gujiya are also known as Puli Pitha, Karjikai,Kadubu, Somas or even as Indian Empanadas. Eventhough they look almost the same as half moon like shape, they are made with different stuffings. Mawa Gujiya goes for khoya stuffing,the famous milk solids usually prepared by slow cooking full fat milk in a pan for hours which involves constant stirring. If you dont have much patience to prepare khoya in the traditional way, you can easily get them from stores. Coming to Gujiyas,this Indian empanadas is prepared with a maida dough, stuffed later by mawa stuffing.These deep fried beauties are quite addictive and the stuffing is just simply out of the world. When conserved in an airtightened jar, gujiyas can stay prefect for many days in room temperature. But trust me, these gujiyas are very much delicious and addictive to store them for a long time. After making a fingerlicking Malai Kofta Curry, this month's challenge for South vs North Challenge an event owned by Divya Pramil is landing towards Uttar Pradesh, Santosh Bangar the host of this month from Northern team challenged us Mawa Gujiya for this month's challenge.If you want to be a part of this challenge, dont forget to join us, just send a mail to the Divya and get ready to face the challenge every month. Baking has became a passion for me, if i feel stressed or very happy the first thing i want to make is to bake something. If my oven can speak, trust me it will cry. Sometime i can bake for a whole day, yep i love baking that much. You would have noticed that am a part of many baking events going around in this immense virtual world. 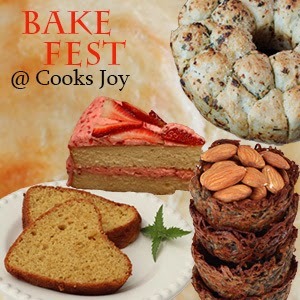 No doubt that i love hosting baking event in my blog as well.Am hosting Bake Fest, a fabulous baking event by Vardhini of Cooks Joy during this whole month. This event is all about baking, just dedicated for baking. This baking event doesnt have any theme, so obviously you can send me anything that you have baked just with your oven, sounds easy na. Dont forget to link me your entries during this whole month. 1. Send in any recipe that has been baked / broiled. 2. Only veggies are accepted.Eggs are allowed. 4. 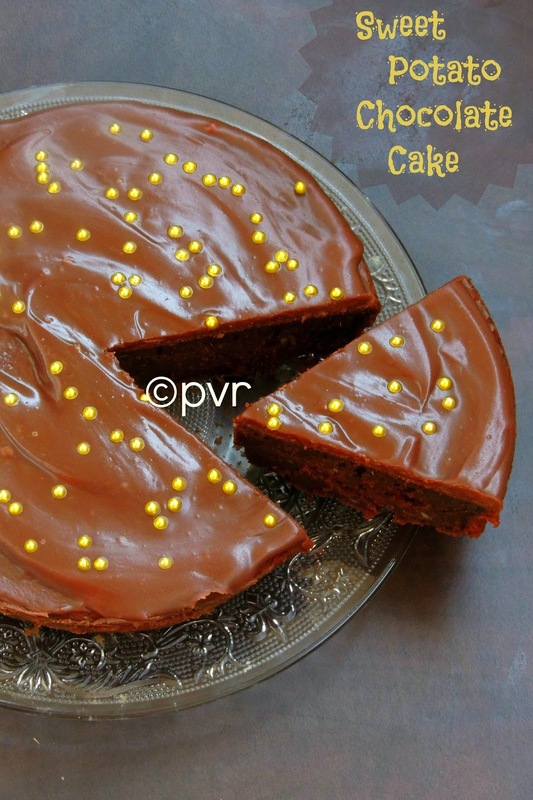 Link to Vardhini's Bake Fest announcement and my announcement page is mandatory. If sending an old entry, it needs to be re-published with the links. 5.You can send in any number of new entries and a maximum of 2 old entries. Dont forget to link your entries to the linky tool attached below.